Editor’s Note: This resource has been revised and updated for 2019 best practices. The reason I bring this topic to the forefront is that recently, at a community meeting, I learned that home burglaries in my area are on the rise. This, in a community where many still do not lock their doors, was no surprise to me given the dire straits so many are in financially. And this isn’t localized. As the financial crunch continues with no end in sight, you can expect to see property crimes on the rise. The meeting was a wake-up call reminding me that I need to do an inventory of the home security and crime prevention measures currently in place so that I can ensure that both my family and my preps are secure. In doing so, I came up with these 20 time-tested crime prevention secrets for preppers. 1.29 29. Think twice about those social media posts. 1.30 30. Have a firearm and know where it is and how to use it. 1.34 34. Keep vehicles locked. Vehicles that are kept quite far from your home can be especially enticing. 1.35 35. Arrange for package delivery when someone is at home or alternatively UPS and Fedex will allow you to pick up at the nearest office. 1.37 37. Being flashy is not always a good idea. 2.1 Try to see yourself through the eyes of someone that is either desperate or a seasoned thief. 3.1 Shop Emergency Essentials Sales for Fantastic Deals! There are lots of things we can do to make our homes seem uninviting to criminals. The more difficult your property looks to breach, the more likely it is that would-be thieves will select an easier target. Yes, it is an annoyance to carry multiple keys but why make it easy for the bad guys? A deadbolt is essential and even two would not be excessive. Make sure the locks are difficult to pick. Remember that a lock is only as good as the strength of the door frame. It doesn’t matter how many locks you have if they are only supported by a flimsy interior frame. A strong person can generally break those down with a well-placed hit from a shoulder. Invest in a high-quality metal frame. These are very difficult to breach. If you lose your keys, and who hasn’t, why advertise your home location and provide easy entrance? You might as well put a sign on your front door that says “TAKE ME”. This does not have to be costly. Even shaded areas will benefit from inexpensive solar lighting. Put porch lights on a dawn to dusk timer and make sure your garage entrance is not shrouded in darkness. Motion lights around doorways can be startling since they come on when a person walks up to the door. I am not talking about an expensive monitored alarm system and, as a matter of fact, I think advertising that you have a monitored system, whether it is true or not, simply tells the world that you have lots of goodies that need protection. When I say alarm system, I am referring to a loud horn or blast that goes off when someone invades your territory. This is especially effective if you have neighbors who will also hear the alarm but even in a more remote area, the alarm will annoy and dissuade the burglars from sticking around. These wireless motion sensors can be installed on doors to scare away a person trying to break in. Best of all, they’re battery operated and will still work during a grid-down event. This includes your emergency food storage area, crawl spaces, and your freezer. Many people keep their freezers in the garage, which can be one of the most vulnerable areas of your home since it is typically dark and remote sound-wise from the rest of the house. In addition to minimizing identity theft, an overflowing mailbox is an open invitation to thieves who will assume you are not at home or traveling. Invest in a PO box – they are cheap. Trim shrubs that are close to the house so that strangers can not skulk behind them, waiting and watching for the best time to attack. Make certain that the perimeter of your home is clear of hiding places. Open spaces make it easier for the neighbors to see if someone is up to mischief too. This may not work in all situations but here in my rural community, we are encouraged to let the authorities know when we are going to be off-island for an extended period. Whether they are strangers, delivery people, or even officers of the law, if they are unexpected, you need to be alert. These are all common ruses that precede home invasions. Have your pepper spray handy and ask for ID. If in doubt, do not open the door. Ask for a badge or ID number and call it in. Remember, uniforms can be readily purchased online and in these days of Photoshop, fake IDs can be easily created on a home computer. Recommended: Read the BDS guide to the Best Pepper Spray. If you lock your gate, then you don’t have to worry about people showing up right at your door. Plus, you’ll be sure to be on high alert if there’s a knock at the door. I have said this before and will say it again: neighbors and community members who know you by name and face will be the ones that will watch your back in a crisis. You do not have to become best friends with these people – but you do need to say hi once in a while and perhaps get involved in some community activities so that they can get to know you and you, them. A dog is a great, really great, early warning system. Heck, my little six pound Yorkie makes a lot of racket if a stranger is walking around outside at night. He might not scare an intruder once he is in the house, but he certainly would give the would-be burglar reason to look elsewhere. Plus, we would know that someone who should not be here is close by if not inside our home. Inhospitable doesn’t mean the plants aren’t beautiful. Thorny plants like rugosa rosebushes, bougainvillea, or blackberry vines make it far more difficult to sneak around outside of windows or to climb fences. You can find a full list of inhospitable plants here. Have someone mow the grass when you will be gone for a week or longer and if you still have the newspaper delivered, for goodness sake, stop delivery while you are gone. You can also put a light and a television on a timer so that it looks as though someone is home. There are a lot of reliable house setters out there. There are some that do it for a profession practically and have impeccable references. Of course, getting a close friend or family member you trust is always a good option if you can. If someone is in and out quite often or there the entire time, it doesn’t give thieves an opportunity to predict patterns so they have time to orchestrate a robbery. Before bed each night, block the track of sliding doors with a metal bar or a piece of wood. Those locks are very easy to force. It’s a very simple thing for a thief to break out a small window, then reach in and unlock your door from the inside. Invest in some decorative metal grid work to make this more difficult. In the worst case scenario, if someone breaks into your home while you are there, it’s important to have an area that you can run to until help arrives. Reinforce a bedroom door with a good quality frame, and replace the flimsy interior door with an exterior one. Have a way to call for assistance inside the room, and a method of self-defense like a firearm. You can learn more about building a safe room in your home or apartment here. This is my weakness and something I will commit to stopping RIGHT NOW! In my effort to spread the word about family preparedness, I talk about my own efforts, what I have, how I am storing it, and worst of all, where I have located my stuff. Shame on me. What I have effectively done is advertise the fact that if the SHTF, you can come to my place because I have food, I have water, I have stuff. This is going to be difficult because I do want to educate and help others. But I am going to really try to be a bit more private going forward. During hard times your neighbors may show their true colors. This means that you need to be on guard for potential threats. It is amazing what hard times can make people do. If you are already not getting along then you need to be more on guard. I remember that living in an apartment in Ketchikan, Alaska our next door neighbor is actually what lead us to start carrying all the time. He was abusing his wife and someone downstairs called the police but he thought it was us and proceeded to make violent threats in an alcoholic stupor. Scary when you share a wall and your entry door is just a few feet from theirs. Up there, there are no concealed carry laws but the violent crime and sexual assault rate is higher than some of the most crime-ridden cities in the lower 48. A lot of people find it hard to believe that but the numbers tell the tale. When times are stressful it can be hard to not take a very big stance that is a bit hostile. I have done this myself numerous times and thing that it was definitely justified in some cases. At the same time taking too much of a defensive position can rub others the wrong way. Think before you act unless it is truly bad enough that you need to correct the situation immediately! These are hit and miss. You need a good line of site for some of these to even begin to work. We live in the mountains so it can be a challenge to get a wireless driveway alarm to work that is far enough from our place to make much of a difference. Recommended: Read our BDS Guardline Driveway Alarm Review here. There are containers that you can bury to hide all types of things. They are made for stashing ammo mostly and you certainly don’t want to forget where you buried something. At $20 these are very inexpensive and they certainly make sure that items remain dry and the inner liner reduces any odds of corrosion. I realize that burying your valuables is not practical for everything and it is even a little extreme. An indoor safe can help prevent some thefts but do realize that there are some thieves that will simply take a safe and then crack it later. If you have it where it might be found with any level of ease then you should take some precautions and bolt it down. It is best to hide it. The whole idea of a safe hid behind a picture is actually not a bad one. If you have room in an attic or other recessed space then this is advisable. Everyone is guilty of fantasizing about something at one time or another but when it comes to defenses, imagining yourself acting out a situation perfectly is not always helpful. Any weapons or defenses you might have you need to brush up on and know how to use well before any situation. Even if you don’t get a concealed carry permit, taking the class is not a bad thing because it forces you to think about situations and your rights under the current laws. If also makes you practice because you have to pass a test and sometimes a little pressure goes a long way towards helping move things along! Recommended Reading: The Top Non-Lethal Weapons. There are so many types of fences out there but the cost varies a lot too. You want the best you can afford or if you want something that you cannot do all at once then buy a few supplies at a time and go with it. We fenced our entire 11 acres in field fence but we did it a little at a time due to time and money constraints. You will be amazed at how things progress just doing a little at a time. Smaller properties will be easier and if you are in an urban area you may want a taller and more formidable fence. No one knows your area like you so if you are in a high crime area, take some extra steps towards making it safer for you and your family. I know this is hard because at one time or another almost everyone has something they need to sell. Advertising on Craigslist, Facebook, or any other place gives thieves information. It is just something to be aware of. When you are trying to sell anything of even somewhat significant value, don’t let your guard down. We always make sure there are two people around when we are selling something. Try to conduct sales in a visible area like your front yard or meet up somewhere safe. It is far better to do a deal in the grocery store parking lot where you are visible than risk your personal safety. 29. Think twice about those social media posts. I never tell people even if I am going to the town 4 miles away. Vacations are not really something we do except rarely and I can guarantee that I would not be caught putting up photos that scream to the world that I am hundreds of miles away and going to be for quite some time. Those pics can wait until you get home to be shared. While you may be overjoyed to have booked that trip, don’t give thieves the info they need to clean you out while you are gone. 30. Have a firearm and know where it is and how to use it. A lot of high dollar items like power tools, guns, utility vehicles, ATVs, guns, and some knives have a serial number on them. I keep a list of ours because if anything gets taken and is taken to a pawn shop at any time, the police regularly stop by and check for stolen merchandise. So thieves actually have to be pretty stupid to go to a pawn shop. Besides having to show photo ID, they sometimes take your picture, if a serial number pops up stolen they are in a lot of trouble or at the very least have some explaining to do. It might sound paranoid but people notice the garbage sitting on your curb. If you have a bunch of boxes with the flashy designs showing then people can see some of what you got for the holidays. Break down boxes and turn then the other way out so potential thieves cannot tell what you might have in your home. Cash money stolen from your home is basically impossible to trace. While a lot of preppers understand that having some in case of a situation where cards and banks are not available, keeping too much around where it can be discovered in a break-in could be disastrous. You might want to keep some in your safe and maybe some stashed somewhere else. And never leave any just laying out around your house. If someone is looking for a place to rob and they see cash through your window, even just a few 20s may be enough to make them think they should investigate what you have a little further. 34. Keep vehicles locked. Vehicles that are kept quite far from your home can be especially enticing. Don’t leave valuables visible if someone looks in your car. Even a few dollars can catch someone’s eye. If you have your backup laptop, a few small bills, and a few other small items, then that is enough to get broken into. Cars are not as secure as people think they are. Just because one has smart technology does not make it safe. Vehicles can be hacked and unlocked. It has happened before and I don’t see why it is going to get any better. 35. Arrange for package delivery when someone is at home or alternatively UPS and Fedex will allow you to pick up at the nearest office. Package theft is more common than it should be. UPS is one carrier that allows you to set up a delivery window time if you will not be at home or you can ask them to hold it at the nearest UPS office. While this might sound a bit uncouth, if you live in a small community then you are probably going to hear some stories. Some places have well known ner do wells. To sum it up, if you hear that someone has a kid that breaks into cars then make absolutely sure you are locking up every night. While unfortunately, some petty criminals get away with things for years, especially if a minor, you can do a lot to prevent being a victim of crazy locals by just taking some precautions. 37. Being flashy is not always a good idea. Fancy jewelry can attract attention from the wrong places. Use some common sense and definitely don’t be out and about during hard times wearing the family jewels. Even wearing a lot of fake jewelry draws attention. A thief cannot be relied on to know if something is real or not. The way you dress and appear to them can have an effect on their perception of your wealth. The lady that is always dressed up or the guy that looks like they get all their fashion sense from GQ is going to stand out. No matter how flashy you are, just realize the situation that puts you in, Being naive is not going to keep you safe. Appearance commands attention. People can say it doesn’t matter as much as they want but the reality is that you are judged on it to some degree. I want to pass on that the very best advice I can give: LEARN TO THINK LIKE A BURGLAR! Try to see yourself through the eyes of someone that is either desperate or a seasoned thief. Sometimes it can be quite easy to lose sight of how we are portrayed. To have good defensive measures in place you need to get real. Do you have one of the nicer homes in the neighborhood? Is everyone driving a newer car? Is your place perfectly manicured? There are a lot of things that reek of money and material wealth to a thief. You might not even think of yourself as having a lot but that doesn’t mean someone else doesn’t perceive it that way. In fact, there are plenty of people that truly believe that they are entitled to more and will do what it takes to get it and feel justified in their actions. Since you have it then why don’t they?” It doesn’t matter that you worked your whole life for it. As you know, a crisis can come from a natural disaster, a medical pandemic, an economic collapse, civil unrest, or a man-made activity such as a terrorist attack. I call these “Disruptive Events”. By practicing crime prevention now, and making home security a part of daily life, you can be one step closer to preserving the homestead when the SHTF. Note: This article is a substantially updated revision of an article posted in September 2013. If you enjoyed this article, consider voting for Backdoor Survival daily at Top Prepper Websites! Bargain Bin: Today I have selected some great items that will help you secure the home front. Except for the keypad deadbolt, I own all of these items. 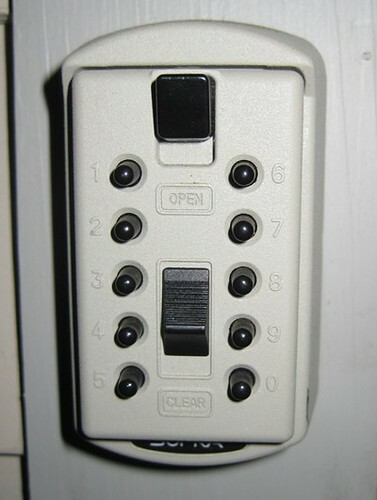 Keypad Deadbolt: Here is another good security option,. With this, you will never have to worry about locking yourself out plus, you can secure the deadbolt from inside the house. Dorcy LED Wireless Motion Sensor Flood Lite: This light is awesome. I use mine downstairs and on my stairwell. When I get up in the middle of the night, the lights come on automatically. It is quite unobtrusive (I own two in black) and gives off a ton of light. Runs for a year on 3 D size batteries. About $20. GE Personal Security Window/Door Alarm (2 pack): These are fantastic at a reasonable price point of $10 for two. They have 120-decibel alarms, loud enough to make a would-be intruder think twice about entering through your doors or windows. Plus, you do not need to be a technical wizard to use them; very intuitive. Holding Your Ground: Preparing for Defense if it All Falls Apart: This is a really good book from Joe Nobody. It is the book to read to learn more about defending your home when bad things are happening. Sabre Compact Pepper Spray with Quick Release Key Ring: The portability of this pepper spray adds to its appeal since it can be easily carried on a key ring or in a handbag or backpack. Sabre Family Home & Property Protection Pepper Spray: This small fire extinguisher-style pepper spray delivers a strong blast covering an entire doorway. Offering extremely practical protection, SABRE provides distance from your threat with its 30 foot range. I like that it includes a wall mount. For a more economical solution, visit your local hardware store and stock up on wasp spray. Very effective. Midland 36-Mile 50-Channel FRS/GMRS Two-Way Radios: These are the handheld radios that I own. There are lots of good uses for the these radios. Handy while hiking, traveling, or simply keeping in touch with your partner while out shopping. Note: the true range for this type of radio is actually 4 to 6 miles, regardless of brand. Don’t be fooled. The Bucket List: The many uses of buckets and help finding the right one! Don’t forget that a can of wasp spray or a can of carburator cleaner is a very effective weapon against an intruder…and it can be handily kept next to the door… It will temporarilly blind the attacker and they will have to go to the hospital to get their eyeballs working again…. That’s a great idea for folks that live in states that consider pepper spray to be a deadly weapon. Thanks for the tip. Judith, I just read your comment and hopefully by now you have changed your mind about wasp spray, It has been proven that it does not effectively stop an attacker in time to prevent the attacker from the assault. It is best to get a good quality pepper spray and leave the wasp spray for what it is intended for. It sure does in combination with a lighter. If I am being attacked the gloves come off and all the deadly weapons available will be used to rectify the situation. My right to life out weighs a bunch of clowns in government. Being aware of your surroundings at all times; and always, always advertise that you and yours have a keen eye out for the unusual, out of place, and what is out of the ordinary. Thieves and other criminals of opportunity are always seeking the path of lest resistance, so if you consistently demonstrate that you are no easy mark most bad guys will seek someone less vigilant and prepared. Just my two cents. Some of the summer houses in my quadrant of our county are being broken into. The joke is that if you get ripped off, you can drive down to the Mexican flea market an hour south of here and buy your stuff back at a discount the following Saturday. Even so, I called the Sheriff and asked if he could run a few more patrols out our way. But our Sheriff’s department has been cut by about 70% since 2008, it’s a big county with lots of “possum trails” up into the mountains. The Sheriff told me “you people out there are on your own.” At least he was honest about it, and I see his point. I’ve got a steel gate on the trail up the mountain, motion detectors on the three access routes (two deer trails and the jeep trail”, a pack of dogs, a flock of free range chickens that roost all around the place in the trees and raise hell at night if they are wakened. I have security cameras, low intensity red lights outside. To tell the truth, I’m more concerned about bears than I am people. I had an electric fence around my buildings until the ice storms destroyed it last winter. Haven’t gotten it fixed yet, and don’t know if I will, it’s a massive undertaking. All very good suggestions; I would add only the following to sensor lights. One, a shotgun, two, one well loaded (personal defense rounds) .38 caliber revolver and speed loaders for each adult resident and three, practice, practice, practice. Why the .38? My personal preference after watching way too many automatic 9 mm and .45 ACP jam at the range. Also, you can “practice” by buying a Lazerlyte practice light that fits in the barrell which shoots a laser beam. We use the LT Pro. Also, by practice, I mean practicing a “plan” for problems that might arise with your partner. I will need to research the Lazerlyte. Not being experienced in firearms, I want to learn as much as I can and, as you say, practice practice practice. Luckily, Survival Husband and I are on the same page. This are all good tips to remember. I keep having to move my supplies around whenever apartment maintenance comes around. Don’t want anyone knowing too much about what we have. Then there’s keeping the blinds closed at all times. Think like a burglar is great advice – I heard about a nice subdivision getting a rash of burglaries, because thieves were scoping out windows that had the bluish light coming from large flat screen TVs. If the TV was big enough, the light would reach up to the higher windows and those homes got targeted. When I heard about this, I thought, “Who would even think about stuff like that?” Apparently those burglars do. We’ve had a series of break ins around us. Seems they are targeting the homes with Solar Panels on the roof. Have friend who’s an LEO and one of the thieves told him when asked why the homes with the panels on the roof. “Those people must have good stuff because they can afford Solar”. So I’ve been investigating Solar Shingles that are “supposed” to look like regular shingles on the roof. Motion sensing Alarm system – the 3rd time an A___W___ kicked my door the alarm went off and the creep left with nothing – O Very Well Worth It. Reinforced doors – after the 3rd time I had my door kicked I stripped off the drywayll around the frames of all my exterior doors and lag bolted on 1/4″ x 4″ x 24″ long steel plate to the 2 studs. The bolts on the locks run up behind the steel plates – would take some serious force to open those doors. Added wrap around door reinforcment plates to the door so the wood would not split as easily. Adding one addtional deadbolt to each door. These are ‘single sided’ deadbolts so there is no keyhole on the outside that can be picked. This is mainly for when I am in the house and I know that nobody will get in by picking one of the locks – I sleep very well indeed. Added chain link fence to the outside of my driveway gate so it could not be climbed as well as triple stand barbed wire. Keep the driveway gate closed at all times now. The closest a car can get to my house is 100+ yards. Am currrently installing survelance cameras. I’ve been thinking more and more about security. There are so many things we need to do to harden our house against intruders, including getting a dog to protect us and our livestock. Thanks for a great article. Never will I light the way for any burglar. Here is my story: One night, as my husband and children and I were in bed, almost asleep, two burglars came up to our bedroom window. I had left a pile of bricks under the window earlier that day when I was gardening. Because I had forgotten to turn on the outdoor light, the burglars tripped over the bricks and started cussing. This alerted our Doberman who started barking. The burglars cussed some more and ran off. Never light the way for a burglar. Let them trip over the junk in your yard. Leave your garbage dumpster in front of the front door. Let burglars trip over it. Don’t light their way. A big dog is also a good idea, as you have said. That is an interesting perspective I had not thought of. Basically, create an unlighted collosion and obstable course to your door and/or secluded windows. Thank you so much for sharing this great tip. Nice list. I was with you until you got to alert the authoritarians you’ll be out of town. I think I’ll pass on that one but well done just the same. Please yes, take more concern with your own preps and privacy. Any firearm that jams is no more than an expensive anchor. Get in the shop, test it when you get it back, and go right back to the shop again. A .357 Magnum revolver is better than a .38 Special as it will fire either the .357 or the .38. Buffalo Bore and Grizzly both make some very powerful ammunition for each. Not bad to have around and a sound investment. A Ruger SuperblackHawk or Ruger Redhawk in .44 Mag with a 2 1/2″ barrel puts you into handgun hunting territory. The two manufacturers listed above make some ammo for these that is truly hot. Mind the warnings about what brand or model can and cannot be used! They are there so you don’t make unwanted little pieces out your revolver and your hand(s)!! I think you need to do more research before making random comments. I am refering to the expensive monitored alarm systems comment. I have been in the security business for 33 years and you can get an alarm system and have it monitored for as little as $29.00 per month. Ask yourself how much you pay for your cell phone and then compare that to the cost for your families safety and security… It has aslo been proven thru interviews with criminals that have a record of breaking and entering that yard signs deter them. They say if they see a yard sign indicating the presence of an alarm system they will go to a neighbors home. I really did like the above article about securing the home. We all need to be more alert. The thing I have to be most vigilant about is the kids not locking the door. I’ve come home many times and found my front door unlocked, ready for anyone to walk on in. Whatever precautions you take, make sure everyone understands them and will follow them. Keep your plans no matter HOW excited you are about them off of,m and OUT of all social media. The current crop of thugs are wired as well, think they aren’t checking Facebook or other social media when they are in certain neighborhoods? I added a what I call a ‘storm door’ to the front. It opens outward and would require a little extra effort by anyone who would force their way in. It’s mostly glass and it does lock. I liked most of what you said in this article except the part of the (expensive monitored alarm systems). I have a monitored alarm system and it only cost me $18.00 per month. I find that very reasonable. I work 40 minutes from my home and I also live in a very secluded area. If my alarm system was not monitored I would never know when someone broke in until I come home. Possibly confronted by the intruders. I have had someone enter my home once while I was at work and it was very confronting to know the sheriff could respond immediately, while it took me the 40 minutes to get home. If the $18.00 is expensive to you, then I say you have your opinion, but to me it’s cheap security. All good points and links by the author! I live in a pretty good neighborhood with low crime stats and used to leave the house for short periods of time with the doors unlocked. Overall a very informative article and some of the suggestions are relevant to my situation. This is an excellent list! One tip I would add is to make friends with your neighbors. Find a couple neighbors that you feel like you can trust so that they can keep an eye on anything that seems weird while you are gone. Thank you so much for the article and comments. My home was broken into yesterday and I am feeling very vulnerable. Both the front and back doors were pried open to gain entry. My husband interrupted the intruder, who ran out without getting anything into his car. My husband got the license plate and was able to id him in a photo line up. Our area is considered “safe” so until now, I was pretty confident of our safety. Not any more! With all the products available commercially, it is so helpful to have your very practical advice. Again, thank you! Great tips. I will have to have a copy of your tips just to be sure. Thanks for sharing. We gotta do what we gotta do to protect our sacred homes. We are living in a dark and evil world as we know it. Coincidently, tonight our local news station-Fox5 ATL–did a piece on asking prisoners what would deter them from breaking in a home. 70% said a dog or a Security Monitor company sign WOULD NOT deter them. Lot of good ideas and good comments. Number three: “Do not leave keys out”. This is by far one of the most common mistakes people make, robbers know the popular areas to hide keys. If you make this mistake then your strong door becomes pointless. Thanks for pointing this out as I assume people will be doing this currently not realising how risky this is. I live in a 2 bedroom apt with a bath without windows. It has roof exit fan with blower (electric) and if shtf, can I cook there without others being able to smell food? Walls are very well insulated and firewalls between apartments. We fenced our property and planted unfriendly plants, but we also strung thin wire and fishing line all through the trees and plants around the parameter, you cant see it and would have one hell of a time trying to get through it. Game trail cameras for video evidence. I wish I could share your articles on facebook.